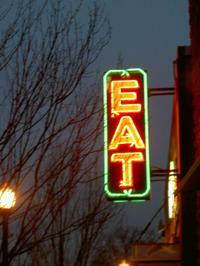 At the intersection of Washington Boulevard and Pershing Drive in north Arlington, a bright green and red sign emphatically entreats passersby with the simple appeal "EAT." This same sign has been greeting customers for over 25 years to the old Arlington fixture Whitey's, which shut down about five years ago. In its place, Tallula restaurant has been providing Arlingtonians with nouveau American cuisine since 2005. Housed in the bar area of the now well established Tallula, EatBar is the DC area's first "gastropub." All the rage in London and the more cosmopolitan cities of Europe, gastropubs are built on a simple philosophy: to provide innovative but familiar house made food along with fine brews and vino. Having experienced mixed success as Tallula's lounge the restaurant re-branded the bar early last year, and though they've experienced their share of growing pains and setbacks, the new concept seems to be taking off. Built on the 'Amuse Yourself' program employed by the restaurant, EatBar's menu shines best with its sizable assortment of 3-bite treats, ranging in price from $2.25 to $6.00. In keeping with the gastropub philosophy, everything is made on premise, all the way down to the condiments. Included in the array of artery-clogging treats are a crispy risotto fritter in a green curry sauce, warm house roasted olives (which I like but my girlfriend finds odd), onion rings with homemade mustard (which we both agree are greasy and sub par), and an extraordinary trio of bacon wrapped figs in mascarpone cheese (which we both would eat a dozen of it wouldn't prompt instant cardiac arrest). The frites are well prepared, crispy shoestrings and make a great snack when paired with a couple of "baby burgers," which are great as long as you enjoy the taste of truffles. In addition to the apps EatBar offers a simple but well chosen menu of full size entrees ranging from about $8 to $15 dollars (note: for several items this price does not include a side). Vegan dining is right out, but those who eschew meat won't starve: the EatBar salad is a fresh and simple selection of baby greens and shaved fennel, and the grilled cheese panini is gooey and delicious. Come springtime they will hopefully bring back the tomato and cornbread salad, which is an amazing light-but-filling salad, perfectly balancing the saltiness of feta and olives with the sweetness of the cornbread and tomato. Anyhow, back to the meat. 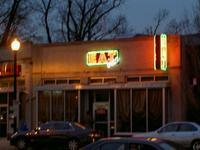 The house made hot dog is easily EatBar's greatest contribution to the DC area's culinary culture. More bratwurst than ballpark, this all beef sausage is huge, with perfect consistency and just the right amount of grease and salt, served in a toasted bun that is actually the right size! Though I've read of people having mixed experiences with the dog, in several outings I have never had one that wasn't plump and fully cooked. Items come out as they are finished, so if you are one for traditional three course dining, you might be better served elsewhere. However, this breezy sort of service leaves one plenty of time to sample the substantial wine list. EatBar offers a staggering 70 wines by the glass, differentiated by color, weight and style. Prices range from about $7 to $17 a glass and the wine is served in full size Bordeaux glasses at much closer to proper temperature than you find at most wine bars. While there is a sprinkling of restaurant standards on the list, by and large it is an eclectic mix of wines from all over the world, ranging from crisp Loire whites to heavy Spanish monsters. Though there is no real sommelier that I've ever met, the bar staff is friendly and will usually let you sample before you take the plunge. The bottle list, too, is quite lengthy and surprisingly wallet friendly-- I found a 2000 vintage Cotes du Rhone on there a few weeks back that was drinking very well for about $20! The beer situation is unfortunately a bit touch and go, and both beer and wine selections could stand to be rotated more often-- that said, the very breadth of selection will not leave you wanting for something new, as long as you are on the adventurous side. Problems of drink and food rotation aside, I find myself going to EatBar again and again, not only for the addictive snack foods, but for the fun and welcoming vibe as well. While paper menus may be few and far between, all you have to do is refer to the framed blackboards behind the bar, a cute and innovative homage to your friendly neighborhood deli. Sunday night is movie night, so if you find yourself free on a weekend night and don't want to shell out $10 on a ticket to Hollywood's latest piece of schlock, swing by and see a classic--a glass of Cab is a far better investment in my opinion, and the truffle popcorn and candy are on the house! It’s these little touches and more that make what could be an intimidating venue into a rather comfortable affair-- more reminiscent of Whiteys really than is evident at first blush.